The Elgin West Greenway Walk follows a tributary stream of the Upper East Don River as it winds along the trail linking Twickenham Park with Mill Pond Park. The natural beauty and serenity of the forests, streams, and ponds along this walk can be a source of inspiration and wonder in any season. There are year-round opportunities for fun and exercise along this trail, including walking, jogging, cycling, skating and cross-country skiing. At the A.J. Clark Interpretive Centre in Elgin West Community Centre, you can learn about the science of archaeology and see artifacts from the past, when First Nations people lived in this area. The walk is approximately 4 km in length (one way), along both gravel and paved surfaces, traversing slightly and moderately sloping terrain, and requires a moderate level of exertion. Approximate walking time: 1.5 hours. 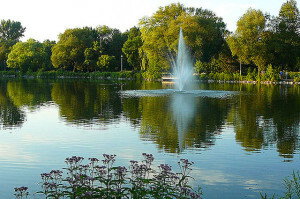 Wheelchair accessible routes are provided at the Elgin West Community Centre and from Mill Street, along the Mill Pond Park Trail. Public restroom facilities are available along the walk at the Elgin West Community Centre and at Mill Pond Park. Parking is available at the Elgin West Community Centre and Mill Pond Park.